XL600R Shock Linkage, originally uploaded by evanfell. Motorcycle shock linkages (aka rear suspension linkages) need to be cared for properly. This is the shock linkage out of my Honda XL600. When I got the bike I knew the rear shock linkage was a little worn, but neglected to replace it for several months. Over time the linkage became extremely worn, to the point where the rear of the bike felt very loose while cornering and awful *clang* sounds echoed after every bump. I continued to ride the bike a little, but VERY cautiously. When I eventually did get around to replacing the linkage this is what I saw. Look closely at the bolt hole connecting the dog bone to the shock arm. It was extremely ovaled. This is very unsafe and could have been catastrophic if it broke while on the road. Whenever you notice the shock linkage having play you should immediately fix it for your own safety. 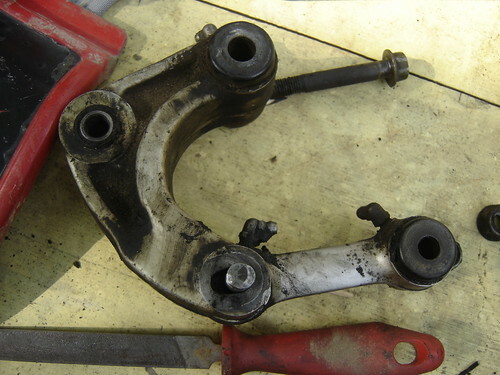 The XL600 does not use bearings in the linkage, just greased bushings, which is why they are prone to failure. Make sure you grease your linkage regularly if it has zerk fittings and inspect it from time to time. Most modern bikes now use bearings in the linkages which can be replaced for minimal cost without replacing the entire linkage. To inspect the condition of your linkage is easy. First just look at it. Is it dirty, gunked up, and covered in grime? If so, take it out and give it a good cleaning, not only will you know for sure that it’s in good shape, but you’ll have a fun project for the afternoon and a nice shiney linkage. To test if the bearings (or bushings) are worn or ovaled simply put the bike on the center stand with the rear wheel off of the ground. Grab the rear wheel and lift it upwards. If there is ANY play in swingarm then your linkage bearings (or busings) are worn and need to be inspected/replaced.